Did you know that lower back pain affects 5 million people in the UK population every year? Around 20% of people with lower back pain will consult their GP about it. What is sciatica? Let me explain. Technically, sciatica is caused when one of the discs in the lower back is damaged and compresses one of the nerves that exit the spine. It can also be called a ‘herniated disc’ a ‘slipped disc’, ‘ruptured disc’ or ‘pinched nerve’ or ‘prolapsed intervertebral disk’. The good news is that there is something you can do about sciatica pain. In today’s post we are going to look at how you can relieve the pressure and start to get your sciatica under control. In general, non-surgical treatment which consists of massage, gentle movement of the vertebrae to reduce tension should be able to help you to move better and decrease the pain in between six and twelve weeks. Avoiding movements that cause pain will help to not aggravate your back further. Heat therapy may relieve pain and muscle soreness because it opens up blood vessels, increases blood flow and supplies oxygen and nutrients to reduce pain in joints and relaxes sore muscles, tendons and ligaments. Heat also reduces muscles spasms hence it can increase the range of movement. Heat can be applied by using an electric or microwavable pad, gel packs, or hot water baths or showers. Make sure that if you use a hot water bottle with no cover that you wrap it in a cotton cloth to avoid scalding yourself. Do not use heat for more than 20 minutes. Do not use heat if there is swelling. Do not use heat if you have poor circulation or diabetes. Do not use heat on an open wound. Do not fall asleep on a heating pad as you might scold your skin. Ice therapy can also help with the inflammation because it slows down the blood flow to the injured area, hence reducing the pain and swelling. Cold can be applied by using an ice or gel pack. Any cold treatment should be used for 24 to 48 hours after an injury. Apply cold pack or ice bags for no more than 20 minutes at a time, removing the cold for about 10 minutes before reapplying it again. A small pillow between the legs when sleeping on your side may be also helpful because it helps to relieve pressure on the disc and ensures that the pelvis and the spine are not twisted. Avoid bed rest for any longer period than is necessary. While bed rest may help with initial symptom it may not speed recovery. Resuming normal activity is usually better because movement brings blood to the injured area helping the healing process. A diet rich in antioxidants such as Selenium, Zinc, vitamin A, C, E and flavonoids found in fruit and vegetables helps to protect the body from pro-inflammatory molecules called cytokines. Whilst omega 6 tends to be more pro-inflammatory (it is usually found in processed foods), omega 3 fatty acids promote the formation of prostaglandin and leukotriene that are anti-inflammatory. These fatty acids are found in various kinds of cold water fish (salmon, mackerel, sardines etc.) and in plants such as flax seeds. These foods are very effective against a number of diseases like acute traumas, injuries, arthritis, cancer, indigestion, etc. They also reduce inflammation and help the body to heal. You can usually return to work (before you are pain-free) if discomfort is bearable. Make sure that you ask your employer to modify your work duties to minimize the risk of long term problems. Once you are pain free NICE (National Institute for Health and Care Excellence) guidelines recommends back core strengthening exercises and aerobic exercises which minimally stress the back, for example walking, cycling, or swimming. For more exercise look at the: Exercise for low back pain from Back Care – the Charity for healthier back. Before using any medication you must consult your GP. Drugs have side effects and you might experience unwanted symptoms if you are already taking already any medication prescribed for other conditions. Over-the-counter medication such as paracetamol, ibuprofen or naproxen may be effective. If pain is still acute and not controlled, codeine can also be prescribed, however adverse effects such as constipation, as straining to passing the stool can aggravate sciatica pain. For muscle spasm diazepam may sometimes also be prescribed. If the pain remains uncontrollable drugs such as amitriptyline, gabapentin, or pregabalin, may also be considered. If medication does not help than your GP might advise you to have an epidural injection to alleviate the pain or surgery such as discectomy. Epidural injections can be carried out to reduce the inflammation if the pain is severe. The steroid is injected directly into the painful area around the sciatic nerve to help decrease the inflammation that may be causing the pain. 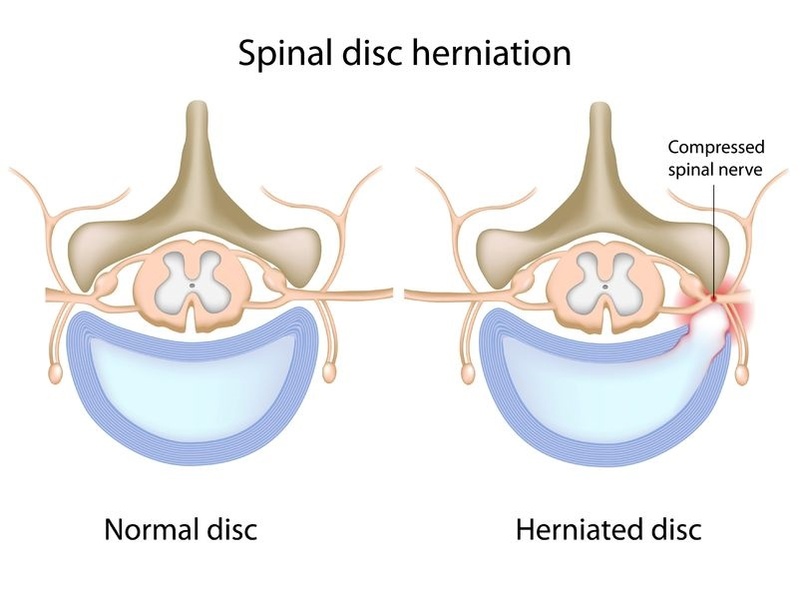 Discectomy removes a small portion of the disc material and/or the bone that is compressive the nerve root. This type of surgery is very effective for relieving pressure on the nerve that causes the pain to radiate from the back in the leg or/and foot. Whilst the leg pain may disappear almost immediately, the numbness or weakness may take weeks or months to get better and the nerve will heal slowly. Regular treatment helps to decrease muscle tension, reduces joint stiffness and helps the body to be more supple especially if you have a job that involves sitting down for lengthy period (e.g. driving or office work). 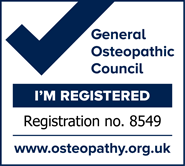 If you are a keen sporty person osteopathy can help you to reduce the risk of developing strain injuries or any pain associated with injuries related to your sport. Osteopathy can help to treat any current pain you are experiencing with a mixture of articulation, massage and stretches. Your practitioner can also correct your posture so that you do not put unnecessary strain on your back. For example, a hunched position whilst working or driving is not ideal for your body. Antonietta graduated from the British School of Osteopathy and has worked in the areas of HIV, Sports, Expecting Mothers and Children’s Clinics. Antonietta is also a qualified holistic and sports masseur. Her specialist areas of interest include the osteopathic treatment of children and pregnant women as well as cranial and visceral osteopathy.